WASHINGTON — With sirens blaring, a fleet of limousines and security personnel raced down Pennsylvania Avenue twice in less than the last 24 hours to deliver Donald J. Trump to inauguration events. Tucked in the 115th Congress’s House Rules package is a quintessential throwback measure that has unions leery of the future of federal employee jobs and salaries. The threat was posted on the Facebook page of “Catherine An Ray”. We haven’t been able to find such a person in the USPS employee database, and apparently neither has the USPS. Raw Story has some additional “highlights” of Ray’s rantings on Facebook here. Tomas Strouhal just wanted to openly support Donald Trump. 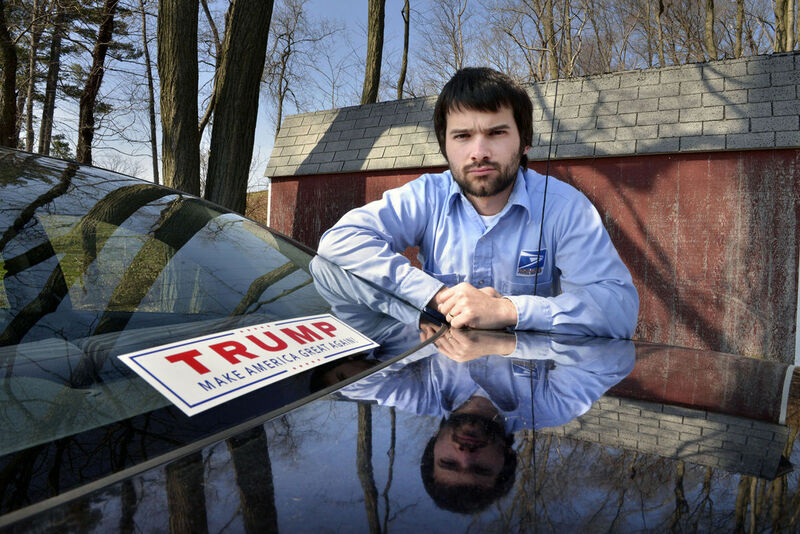 The 23-year-old Quarryville resident put a Trump bumper sticker on his 2003 Chrysler Sebring and hung up a newspaper clipping inside his locker at the Leola post office, where he works. But Strouhal’s employer took issue with them. Citing the Hatch Act, which governs political activity by federal employees, his supervisor said the “Trump: Make America Great Again” bumper sticker must go if his car is parked in the post office parking lot. The USPS later relented, after learning that Hatch Act regulations do allow the display of one election related bumper sticker on a personal vehicle parked in an employee parking lot. Strouhal says he thinks it was his support of Trump that got him in trouble, and claims that “it’s caused his co-workers to treat him differently and have a general ‘attitude’ toward him”. Strouhal says he’s hoping to vote for Trump in November, but there’s one slight problem. Strouhal is not a US citizen. The LNP story says he emigrated from the Czech Republic in 1997, and hopes to become a naturalized citizen by election day so he can vote for the notoriously anti-immigrant Trump. 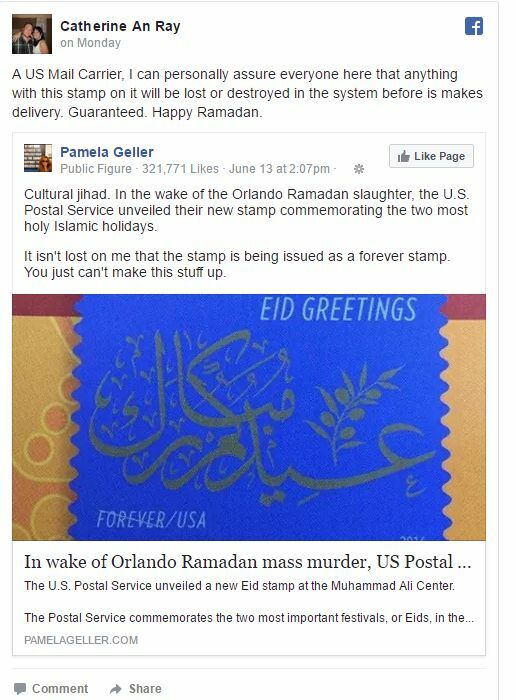 The US Postal Service has responded to the Daily Caller’s bizarre claim that the agency is waging a “War on Religion” because it isn’t printing more religious Christmas stamps this year. In a letter to the owner of the tea party blog, USPS spokesperson Mark Saunders pointed out that the agency already has half a billion religious holiday stamps in its inventory. That’s enough to satisfy the demand for two full holiday seasons. The USPS also noted that that the story was apparently inspired by the reporter’s inability to find religious Christmas stamps at a PO he visited. Of course, the normal time for people to buy Christmas stamps is, well, Christmastime- not August or September- so it’s hardly surprising to find that a post office doesn’t have a ready supply of the stamps at the time. I imagine he’d have a hard time finding Christmas cards in the middle of summer, too! Does that mean drug stores and Wal-Marts are waging “War on Religion”? Saunders noted in his letter that there is a large inventory of religiously-themed stamps issued in previous years available for purchase by the public. He didn’t say how many in the inventory depict religious images or how many feature non-religious images like 2015’s “A Charlie Brown Christmas” and “Snowflake” commemorative stamps. We have more than a half billion religious-themed holiday stamps in inventory and based on prior year’s purchases, that’s more than twice sold during a typical Holiday season. That’s the thing that the Daily Caller just can’t seem to grasp- most Americans aren’t clamoring for more religious Christmas stamps. If they really want them so much, why are there half a billion sitting in the warehouse? Here’s the text of the USPS letter. 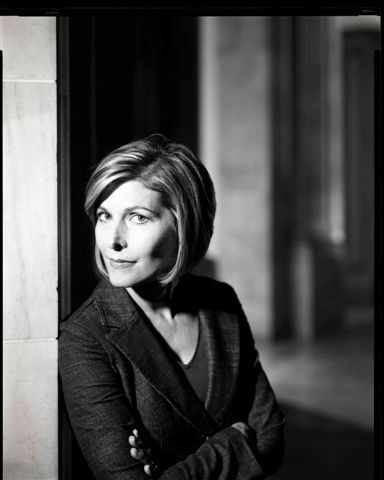 Click the link at the bottom of this post for the Daily Caller’s followup. Your Sept. 10 article “Ìs the Postal Service Declaring War on Religion?¨ is incorrect and misleads your readers into thinking Post Offices will not be offering religious-themed holiday stamps this year. Nothing could be further from the truth. Allow me to set the record straight. Our decision to print select holiday-themed stamps every other year is a business decision based on supply and demand while serving the needs of our customers. Moreover, we have found that the popularity of Holiday Forever stamps ÷ which are good for mailing a one ounce letter anytime in the future regardless of price changes ÷ result in more stamps purchased at a time. Evidently the story idea about the “Postal Service Declaring a War on Religion¨ began when your reporter visited a Post Office and found that it had no religious- themed stamps available. Postmasters have the ability to order holiday stamps, but as most customers wait until after Thanksgiving to mail their greeting cards, Postmasters typically order these stamps in late September or early October. 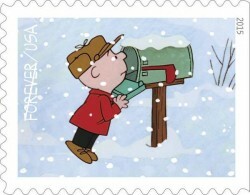 Customers can purchase stamps at Post Offices or online at usps.com/shop. Religious-themed Forever holiday stamps available this year include: Christmas Magi; Eid; Hanukkah; Holy Family; Madonna of the Candelabra by Raphael; and, Virgin and Child by Jan Gosseart. Secular Forever stamps include: A Charlie Brown Christmas (available Oct. 1); Rudolph the Red Nosed Reindeer; Geometric Snowflakes (available Oct. 23); Winter Fun; Global Holiday: Silver Bells Wreath; Global Holiday: and Evergreen Wreath. The Postal Service has a long standing history of celebrating the religions of the world on postage stamps. 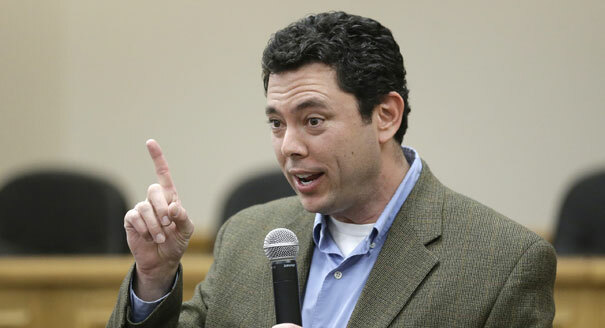 Here we go again- Congressman Jason Chaffetz, the supposedly kinder, gentler replacement for Darrell Issa on the House Oversight Committee, is conducting his semi-annual witch hunt for public sector tax delinquents. If you’re collecting a federal paycheck, you should pay federal taxes. That’s the premise of a bill I introduced last week to require federal employees to pay their taxes or be fired. Going after public workers has become fashionable among right wing politicians- they follow Muslims, Gays, Hispanics and African Americans as the latest scapegoats for whatever is ailing the country at the moment. But there is a certain logic to Chaffetz’s argument. He suggests working for the federal government is a privilege, and that in order to benefit, you should satisfy all your obligations to the feds. Fair enough- and Chaffetz goes so far as to say he would include federal contractors in the deal- don’t pay your taxes, your contracts get cancelled. But I think Jason is missing something here- he says “No one who ducks a federal tax obligation should be eligible to benefit from federal funds.” But he only targets federal employees and contractors. How about all the other people who “benefit from federal funds”? Wouldn’t that include people receiving Social Security, Medicare, veteran’s benefits, crop subsidies, disaster relief, food stamps, small business loans, Wall Street bailouts, and all the rest? Come to think of it, exactly who in this country doesn’t “benefit from federal funds”? So shouldn’t the law be rewritten to require that ANY employer terminate any employee who is seriously delinquent in their federal taxes? Or, at the very least, shouldn’t ALL of their federal benefits be terminated? Fair is fair, right? Somehow I don’t think the Congressman will go that far- after all, a certain subset of the tea party types that he’s desperately trying to woo have a major problem with the very idea of the federal income tax. So I’d only suggest that the Congressman correct one other logical flaw in his bill. If you’re after people who “benefit from federal funds”, remember that the big agency that always gets mentioned first in these stories, the US Postal Service, doesn’t receive any! via Chaffetz wants to fire tax delinquent federal employees- but why stop there? | postalnews blog.